Mind the Bridge: Silicon Valley Study Tour visits Mind the Bridge at Pier 38. Silicon Valley Study Tour visits Mind the Bridge at Pier 38. 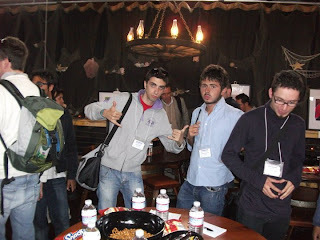 Yesterday a group of about 20 leading students from Italy visited Mind the Bridge office at Pier 38, San Francisco. They are participating to the 6th edition of the Silicon Valley Study Tour, one of the first initiatives aimed at introducing young graduates from Italy to the Silicon Valley, creating useful links with Italian "insiders" working here and giving awareness of the opportunities in the Bay Area. After meeting Elance and the theme-park-looking headquarters of Yahoo and Facebook, it's time for them to enter Pier 38, the funky place in which more and more fledgling Web 2.0 startups are renting desks to stay plugged into the ecosystem. "How can people work here with this noise?" asks Roberta Martelli, studying business at the University of Piemonte Orientale and one of the few girls in the group. A hundred geeks and want-to-be entrepreneurs are in fact having a beer and some pretzels and talking about shiny technologies, new projects, sharing ideas and looking for co-founders. Even if during the day people work hard and are mainly silent, it's routine to have some social events in the evening. Everyone enjoys the atmosphere and starts to meet other interesting people, so that it becomes nearly difficult to start presenting our activity. "Environment and people are so smart here that you immediately would like to join them and create a startup!" says Enrico Cinquini, a student of the University of Genova interested in criptography. Nonetheless, the visit goes on and sitting on couches we listen to Marco Campanari, CEO and founder of Hyperfair, one of the 2 new startups that will take part in the MtB Gym program. The audience looks very interested: finally an Italian promise in the Silicon Valley! After that, we invite our Spanish friend Pedro Moneo to present Opinno, an open innovation network of entrepreneurs and investors, working just beside us, in the same "Mediterranean branch" at Pier 38. People continue to interact, exchanging business cards and eating popcorns. We finally ask Roberto Fonti, a smart Italian guy who founded Buzzbox - a web startup developing Android ad iPhone applications to filter news - to tell his experience as Italian in the Silicon Valley. Even if tired due to the intensity of the day, students are very glad to meet these people really living the American dream. What if one day they become the next Zuckerberg...?